The 176,000 acres of the West Elk Wilderness are a pristine example of Colorado’s wild mountains. The West Elk Wilderness is a little-used wilderness area in the Gunnison National Forest, southwest of Crested Butte. Fall hunting season see the most visitors to the West Elk Wilderness, as the big game hunting here is excellent. Much of the West Elk Wilderness is easily accessible by horseback. For more information contact the Gunnison (970-641-0471) or Paonia Ranger District (970-527-4131). With none of the 1,400-foot peaks that seem to attract hikers and mountaineers, the West Elk Wilderness is a welcome relief from wilderness areas and national parks where people sometimes seem more plentiful then not. While you won’t find Colorado’s tallest peaks in the West Elk Wilderness, you will find evidence of ancient volcanic activity, visible in the form or the ridge, turrets, spires and pinnacles that are reminiscent of medieval castles and architecture, and a secluded wilderness area for hiking, camping and horseback riding. The low number of visitors makes the West Elk Wilderness an ideal destination for private hiking and backpacking trips; it’s not unusual to be out for a number of days without crossing paths with another person. With 200 miles of trails, including many loops and ridge walks, it’s easy to find a day or multi-day trip that fits your schedule. Cliff Creek Trail: If you’re looking for suggestions, the Cliff Creek Trail is a moderate 24-mile loop that leads from Horse Ranch Park (off of Kebler Pass/County Road 12) up and over Beckwith and Castles Passes, where you’ll find striking views of the surrounding wilderness area and the Castles (remnants of volcanic activity). The trail winds its way through aspen stands, forests and meadows much of the time, in addition to climbing into the alpine. Soap Creek Trail: Soap Creek is a good moderate day hike. The nine-mile trail starts north of Blue Mesa Reservoir (take Highway 92 north to Forest Road 721 and then continue down Soap Creek Road) and stays alongside Soap Creek before ascending a ridge, dropping down into another valley and ending at Soap Basin. Fall is one of the busiest seasons in the West Elk Wilderness, as deer and elk abound throughout the unpopulated, roadless wilderness area, making it a prime hunting spot. Outfitters and guides can be found locally to help your hunt run smoothly. Many of the trails that run throughout the West Elk Wilderness are wide enough and suitable for horse traffic, as well. Horse outfitters can be found locally. As with all mountain climates, weather in the West Elk Wilderness can vary greatly, but expect a cool mountain climate with scattered rain showers throughout the summer months. The snow has usually melted out by mid-July, and remains snow-free through September, but this can vary greatly depending on the year and snowpack. The fall hunting season is the busiest part of the year. 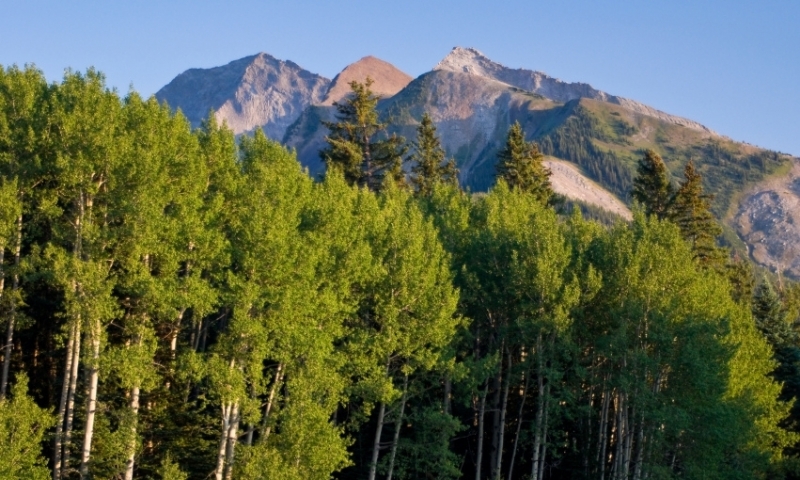 The West Elk Wilderness is located between Crested Butte and Curecanti National Recreation Area. It can be accessed either via Kebler Pass to the north of from Curecanti National Recreation Area to the south. For more information, contact the Gunnison or Paonia Ranger Districts at, respectively, 970-641-0471 or 970-527-4131.